But the most important number is … 20. That’s the number of bartenders who took part in our contest. They qualified by receiving the most nominations by you the drinker, er, I mean, the reader. They deserve your attention. After all, that was the point of this contest — to shine a light on the bartending craft and the people who help make going out a good time. Raise a glass and tip them well! And now the moment you’ve all been waiting for. The end of a two-month-long journey — not to mention a hard-fought campaign. The winner is . . . Rob Turek of the Barley House in Cleveland. He wins a silver shaker trophy, tickets to “Hair” and a Plain Dealer subscription. Yup, that’s him: the area’s pre-eminent purveyor of “flair” — a brand of bartending that serves up wild stunts and tricks performed behind and on top of the bar. Whoa, he can spew fire like Kiss bassist Gene Simmons, using 151-proof alcohol that he lights while spitting it out of his mouth. That’s not to say that “flair” tricks aren’t hellish at times. He still has some burn marks on his fingers. He also has a scar on his hand from an exploding bottle. Then there’s the chipped tooth. 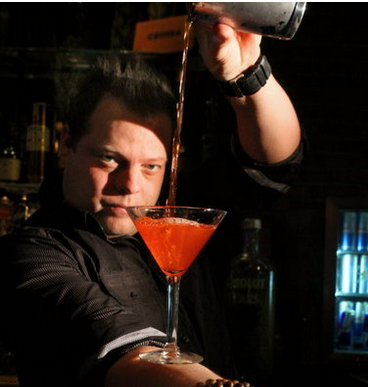 Rob Turek, who was voted Cleveland’s best bartender, performs flair (trick bartending) at the Barley House in the Warehouse District. Turek recently appeared on “The Dr. Oz Show” — to perform a very different trick.